Are you a Pixy? A Butterfly? Or a Unicorn? Whichever magical being you wish to be, Althea is the place for you! You have heard me raving constantly about Althea ever since I first came to know about it. And how fast time flies till it has already reached another post to celebrate Althea's 2nd Birthday. My gosh! My first ever post on Althea was to celebrate their 1st birthday and I have stuck with them ever since. All my beauty and body care products were all sent to me by Pixies from Althea. For this round, I will briefly share with you the products that I've received from Althea in my birthday shout out video below. Later on, I will be doing an individual posting about each item/brand, as usual. So, do wait for that, ya! Obviously, when it came to celebrating their 2nd-year milestone, Altheans were nowhere short of being magical, crafty and ultimately generous. A fan of Korea and all its awesomeness? Then you should quickly purchase your much-wanted beauty products to receive the one-of-a-kind birthday kit along with your items. 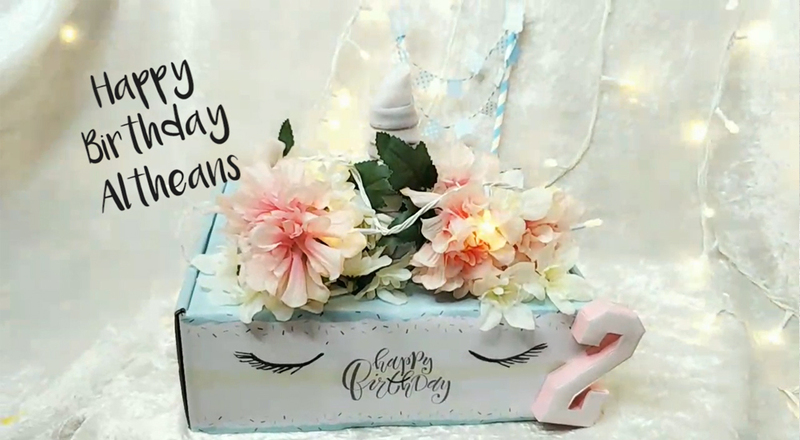 This birthday kit is essential for the most creative 'box creation' show off on Instagram. The grand prize is a flight to Korea for TWO! Equally awesome is the first prize where the winner will get A Year's Free Shopping on Althea! How amazing is that? Second prize is 3 months free shopping on Althea and for the 10 consolation winners, there will be USD$100 Althea credits waiting to be pumped into your account! For 20 days straight (working days), Althea will be giving away a prize on Instagram. What are the prizes? You have to check them out on here (ALTHEA) to know. Seriously, the month of July is amazing! Not only it's my birth month but it also where so many Altheans get to enjoy the magical goodness of Althea! Every week there will be one shopper from each country to win Althea credits. Nope, it isn't a small amount! Based on country: RM1000, SGD300, PH10,000, IDR3,000,000, TH8,000 and USD200. Of course, if there's a giveaway on Instagram surely there's another giveaway going on FACEBOOK! Every Monday, a contest will be up for FB Althean fans, so do make sure that you keep your eyes wide open to not miss out. Yes! Again it's discounts on top of discounts! Which is why you should really start making a visit to their site and stock up on all your favourite beauty products! Of course, all of these contests, giveaways and sales come with their own T&C so do check out www.althea.kr/ for more info. Come on now, I know you want to join in on the fun...do let me know in the comment box below which contest will you be participating in.